"The man behind Morphic Resonance is Cristian Fernandez Font born in 1988 and based in Girona, Spain. He was interested in electronic music since he was a child, growing up with industrial/EBM bands like Front 242, Wumpscut, Velvet Acid Christ, Nittzer Ebb, Funker Vogt, etc. He discovered Goa trance in 2005 with the Infected Mushroom´s track “Devil“ and he immediately felt totally attracted to this kind music. A few years later he was inspired by the new wave of new school Goa artists, especially Filteria, he started to buy synthesizers and to experiment with them. In 2013 the Morphic Resonance project was born with the mission of recreating the true old school Goa sound with hardware equipment. His first release “Chromatic World EP“ was released on NeoGoa Records net label in January 2014. After that, he got the attention of many labels including Suntrip Records where he will release his debut album. 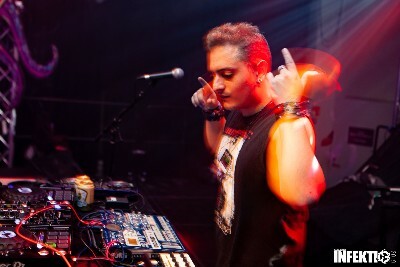 Other labels such as DAT Records, Global Sect and Timewarp want to spread his work and his unique dark acidic melodic tracks. Despite being a very young project, Morphic Resonance played in several countries such as Israel, Brazil, Ukraine, Portugal, Croatia, Belgium and Spain. He shared stage with big names such as Etnica, Pleiadians, Transwave, Filteria, Goasia, California Sunshine, The Muses Rapt, Dimension 5 and among many others.